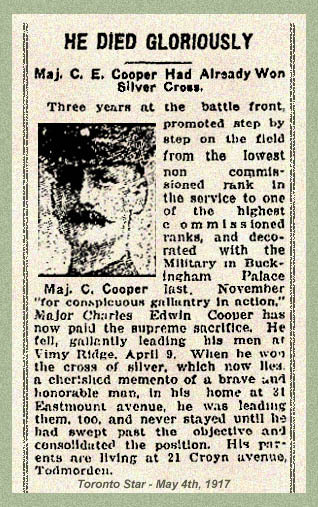 9971 Major and former RSM Charles Edwin Cooper, MC was born in 1880 in Alcester, England. At the time of his enrollment into the 3rd (Toronto) Battalion Canadian Expeditionary Force in Valcartier on 22 Sep 1914 he worked at the picture department of the T. Eaton Company and had 17 ½ years prior service in the 48th Highlanders, Royal Canadian Regiment and 10th Royal Grenadiers. He was a Presbyterian and lived with his wife Sarah at 31 Eastmount Ave Rd., Toronto. 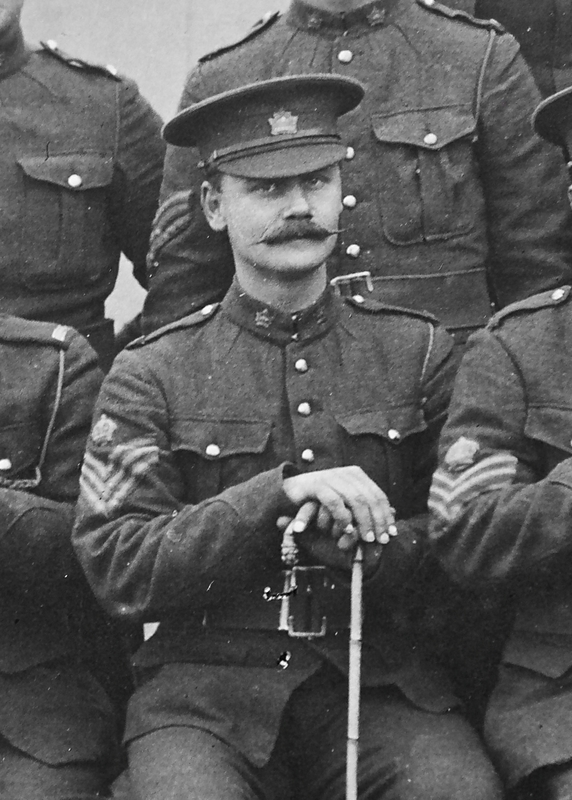 Cooper spent 6 years in the 48th Highlanders before volunteering for South Africa in 1900 with the 3rd Special Service Battalion (RCR) which was posted to Halifax for Garrison duty. Upon returning from a year and a half with the RCR he reenlisted in the Militia , this time in the the 10th Royal Grenadiers starting over as a Private but making the rank of Color Sergeant and being appointed as Drill Instructor by 1911. When he enlisted for active service in the 3rd Bn he was given the rank of Color Sergeant and made a Company Quarter Master Sergeant. By Feb 1915 the 3rd Battalion was in France and by 24 April Cooper was promoted to Company Sergeant Major. He was wounded at least 3 times during the spring of 1915 and by October of that year was appointed Battalion (Regimental) Sergeant Major. By spring of 1916 he was promoted to Lieutenant and by August had earned the Military Cross for his actions on 13 June at Mount Sorrel. By December 1916 he was appointed acting Captain and by February 1917 he was appointed as Acting Major while commanding A Company. He was unfortunately killed in action in the fighting at Farbus Wood on 28 April 1917.